Exercising First Amendment Rights is a Team Sport | Roger Williams University 3.1.17 At a New England First Amendment Coalition event on Feb. 24, Washington Post media columnist Margaret Sullivan began her keynote address by thanking the many journalism students in attendance, including eight students from Roger Williams University. "I admire the fact that you are making the foray into our somewhat treacherous waters at this particular time," Sullivan said. "We need you more than ever." Recipients Call for Relentless Pursuit, Defense of the Truth | NENPA 2.26.17 With new threats to the First Amendment, journalism's role is more important than ever, Margaret Sullivan, media columnist for The Washington Post, told those attending the seventh annual New England First Amendment Coalition awards luncheon Friday, Feb. 24, in Boston. A Change of Heart on White House Leaks | The Westerly Sun 2.27.17 NEFAC's Justin Silverman said, "Once the public has lost faith in the Fourth Estate, there is nothing to separate fact from fiction, truth from propaganda. Yes, we need to demand high standards and integrity from our press corps. But at the same time, we need to discard hollow accusations of 'fake news' and petty grievances with coverage. There's too much at stake to consider every critical news story as the work of dishonest politically driven reporters." Northeastern University professor Dan Kennedy discusses 2017 New England First Amendment Awards honoree Margaret Sullivan of The Washington Post. Sun Journal Receives First Amendment Award | Sun Journal 2.25.17 The Sun Journal was awarded the Michael Donoghue First Amendment Award by the New England First Amendment Coalition on Friday. The award was given to the Lewiston newspaper during the annual New England Newspaper and Press Association convention. The freedom of information award is given each year to a New England journalist or team of journalists for a body of work that protects or advances the public's right to access information possessed by federal and state governments. The New England First Amendment Coalition presented its top honor to Margaret Sullivan, the media columnist for The Washington Post. Sullivan accepted the Stephen Hamblett First Amendment Award on Friday before a large crowd of journalists, lawyers, educators, students, and media executives at NEFAC's annual awards luncheon at the Marriott Long Wharf. On Friday I'll be emceeing the annual New England First Amendment Awards on behalf of the New England First Amendment Coalition, a group of citizens who, according to their mission statement, "believe in the power of transparency in a democratic society," and they work with others to preserve and promote access to public meetings and documents and proper compliance with freedom of information laws. It's an honor for me to be involved with this event because I strongly believe that the news media, whatever its failings, provides an essential service to our country, most notably skeptical oversight of what people with power are doing. Trump Stoops to New Low with Denigration of Media | Southern Rhode Island Newspapers 2.24.17 Justin Silverman, executive director of the New England First Amendment Coalition, said, "President Trump's continued attacks on the media undermine the value of journalism in our country. A reporter's job isn't to pat the president on the back, but to instead pursue the truth, regardless of how it reflects on an administration. As the saying goes, democracy dies in darkness. Trump seems intent on discrediting the very people we rely on to shine light in those dark corners of government." Loeb School of Communications, Manchester, N.H.
Hunt Memorial Building, Nashua, N.H.
Will Vermont Finally Get Serious About Legislative and Executive Oversight? 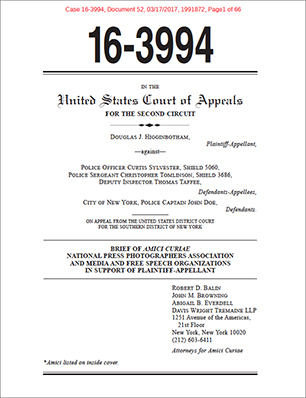 The U.S. Court of Appeals for the Second Circuit - which has jurisdiction in Vermont and Connecticut - is currently hearing the case and has an opportunity to find a clearly established First Amendment right to record police in public places. Bill Ketter | Community Newspaper Holdings, Inc.